We've already been through one kitchen remodel in the recent past (2002 in our old home) so we are really aware that the more planning you can do the smoother the process will be. So, although we probably are 18-24 months away from starting the BIG project on this house, we have been designing and refining the design since we moved in here two years ago. We want to stick to the original footprint of the kitchen and all the appliances will stay where they were originally with the exception of the refrigerator that used to be under the stairs. This was not salvageable and had to be replaced when we first moved in and as no one makes a five foot high fridge anymore we had to put the replacement next to where the old fridge was. We knew this was a temporary placement and now we have a plan to have one wall of pantry units with the fridge/freezer and double ovens in the center of it. We feel confident enough of the design that we are now looking at kitchen manufacturers to bring the dream to life. Last evening we were invited to the opening of the new Poliform showroom. I'm really attracted to the clean lines of the Italian kitchen designers so I was excited to test drive their Varenna kitchens. Despite the complimentary ice cream and white wine I wasn't really feeling that the kitchens were right for us. They were a little too cool for this house which has a lot of warmth from all the stained wood trim, ceiling and floors and I wasn't thrilled with the quality which I felt was only acceptable and not wow. When I looked at the price tags -$75,000-$105,000 for the display kitchens, I was even less impressed and I felt that we wouldn't be being true to the spirit of the house which refelcts Andrew Geller's affordable leisure philosophy. So we're still looking for a streamlined, modern quality kitchen at a reasonable price. This could take some time. Nice Blog!! 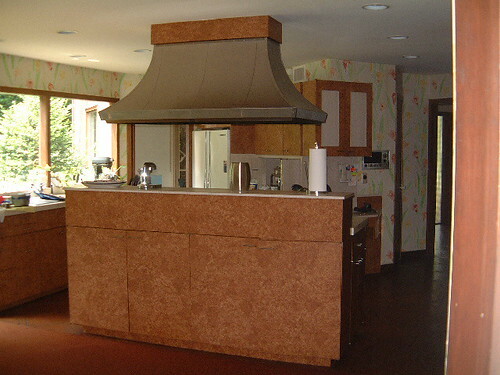 Searching to Find the latest Cheap Kitchen Furniture for decorating your Kitchen, then log on to Metroloftfurniture.com.